This supernova was discovered by Koichi Itagaki (Japan) on 2019 January 09. It is a Type Ia (z=0.00452) supernova in Leo Minor. The accompanying graph shows the lightcurve for this supernovae. Supernova AT 2017EAW in NGC 6946 was discovered by Patrick Wiggins,Tooele, UT, USA, at 12.8 mag on 2017 May 14 at 05:42:43 UT. This supernova is the 10th to be discovered in NGC 6946 in the last 100 years. 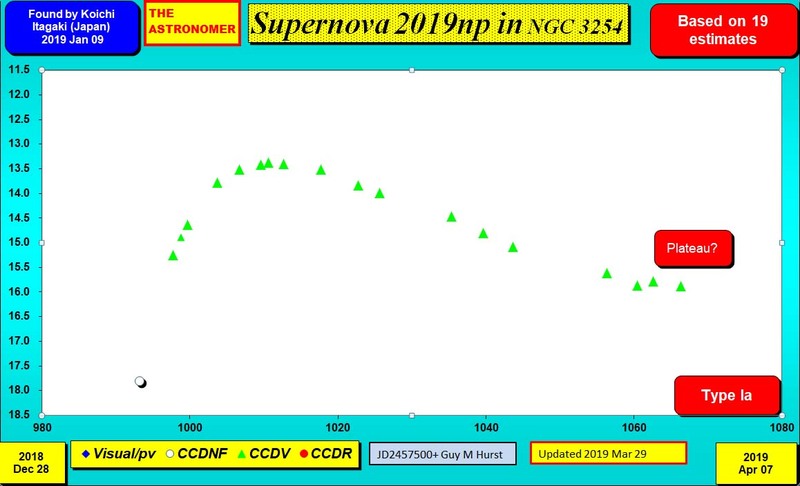 The accompanying graph shows the lightcurve for this supernovae.